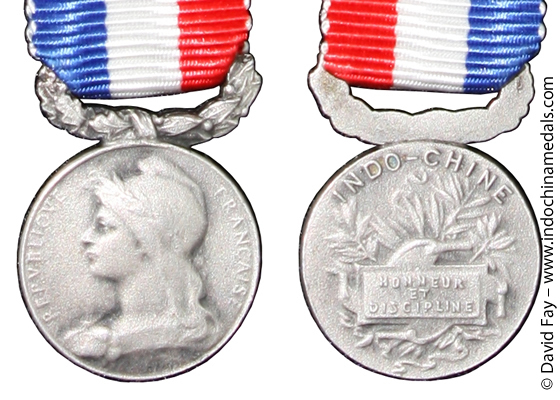 The Honor Medal of Courage and Devotion was awarded in Indochina in various forms. 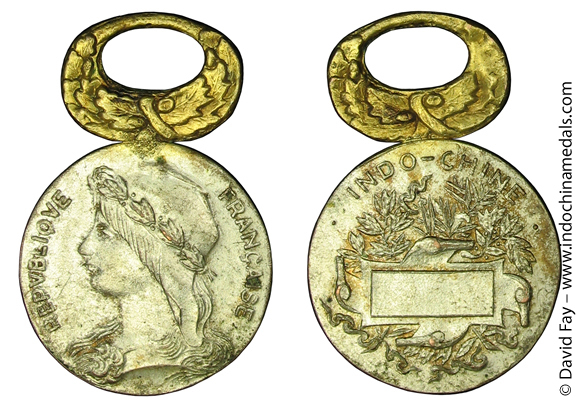 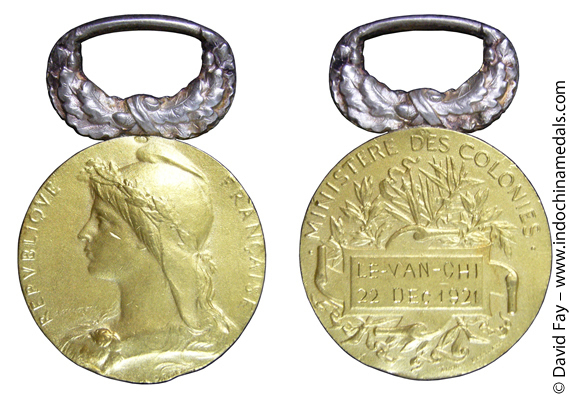 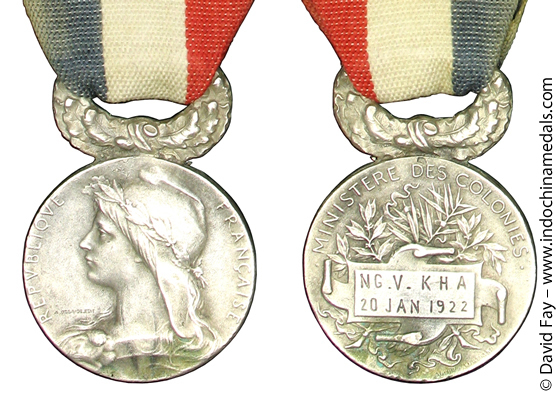 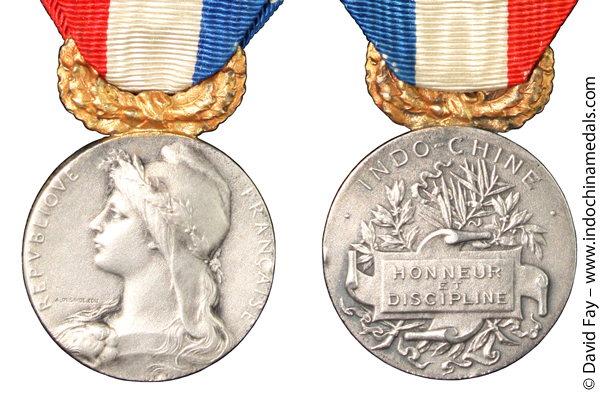 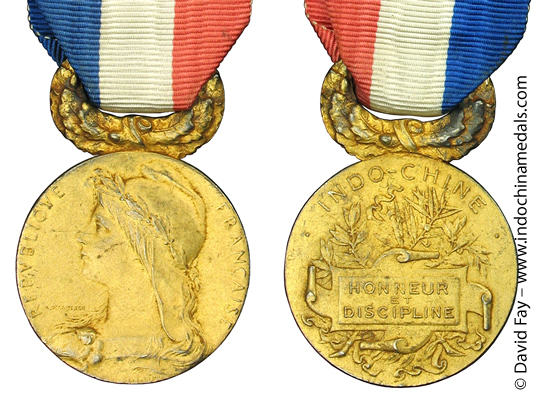 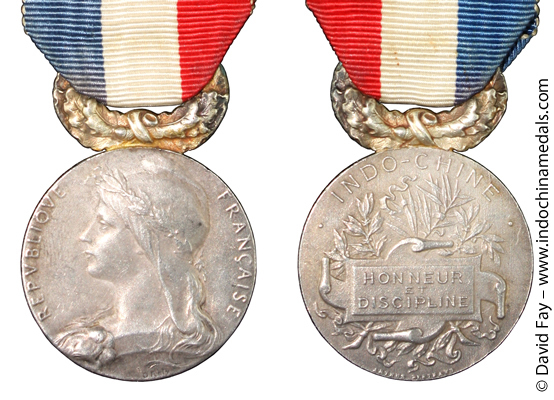 The early medals in use before 1900 were designed by Barre and similar to the regular French honor medals - see here. 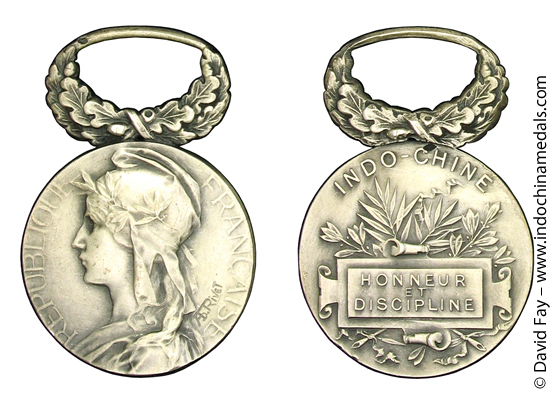 The Roty design of the medal was awarded in Indochina starting in 1896 thru 1954. 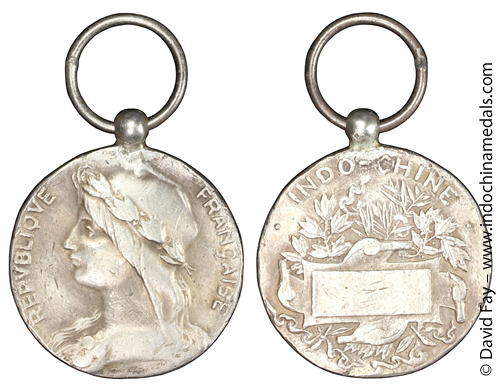 There are types with the inscription on the reverse either "MINISTÈRE DES COLONIES" or "INDO-CHINE". 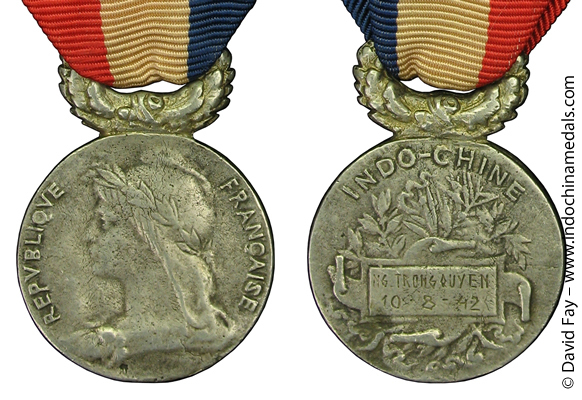 The "MINISTÈRE DES COLONIES" version was also used by the Ministery of Colonies elsewhere in the colonies, however when awarded in Indochina it was managed locally by the Governer General of Indochina. 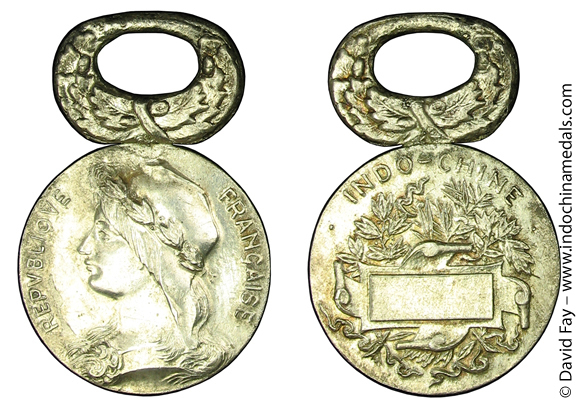 Another type with the inscription "MINISTÈRE DE LA FRANCE D'OUTRE-MER" also exists, but it is not yet known if it was issued in Indochina or not. 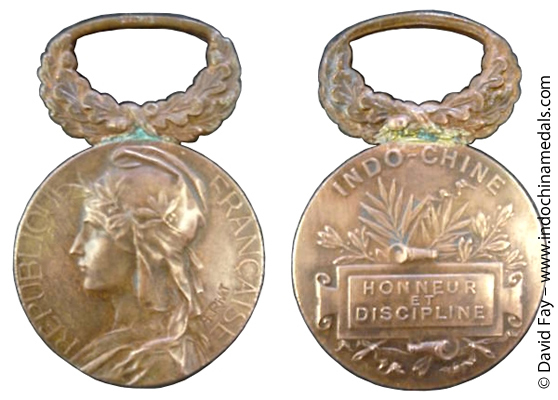 with "A. DESAIDI EDIT" on reverse instead of "ARTHUS BERTRAND"
It is possible that the badge of the Roty Design was manufactured in Indochina and used for other French Indochina awards also during the war period when it was cut off from the Metropole. 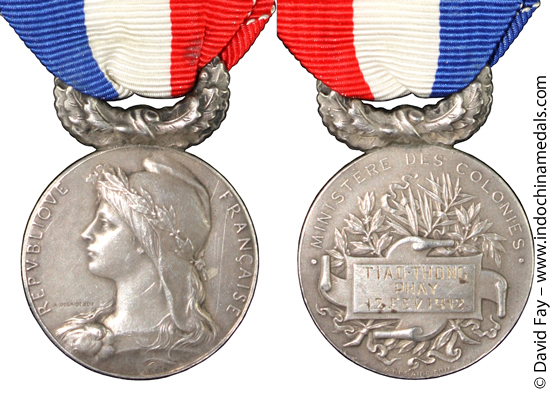 The 1986 Maison Platt auction of the J.P.L collection pictures one with the ribbon of the Penitentiary Service Medal and with an unofficial bar PUOLO CONDORE. 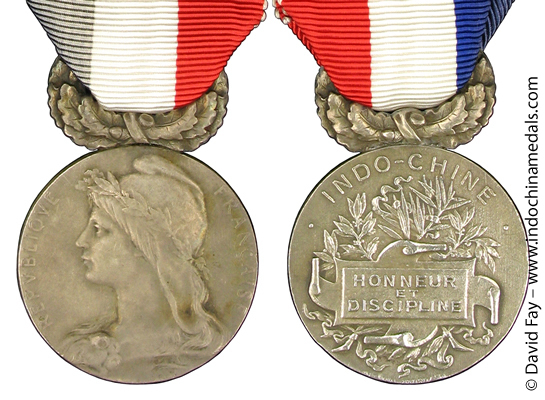 Another medal has been observed in silver with Roty design and inscription INDO-CHINE found without the suspension wreath (just a small ball for the ring), and with the horizontal red, white, and blue ribbon, which was identified as the Indochina Medal for Workers . 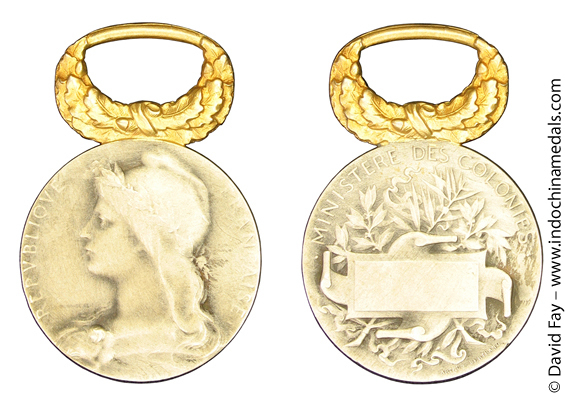 It may be speculated that the authorities used this locally manufactured Roty Design when the supply of proper badges for the awards was exhausted -- or they just may be fantasy pieces. 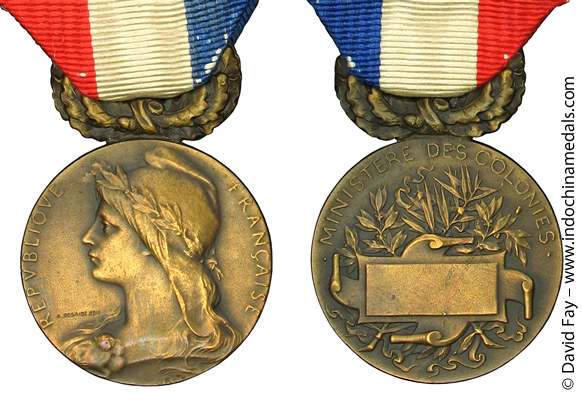 Design: as above, with "MINISTERE DE LA FRANCE D'OUTRE-MER" on reverse. 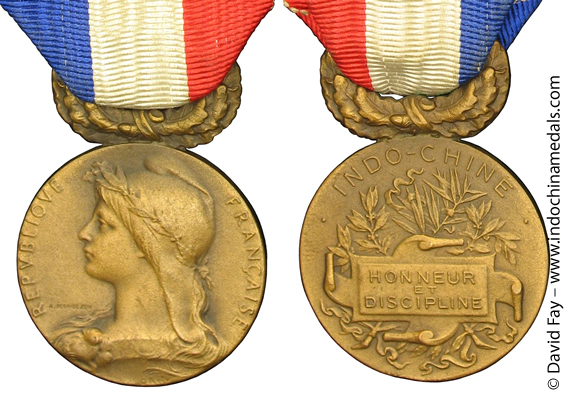 It is not known if this medal uas used in Indochina. 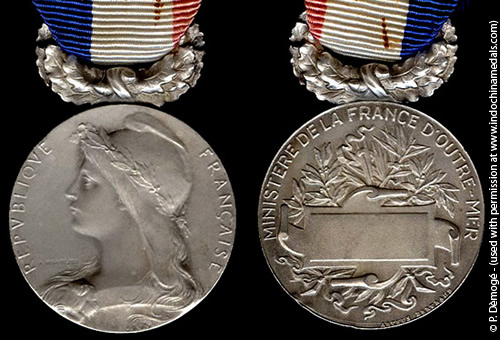 The Ministere des Colonies was changed to Ministere de la France d'Outre-Mer 25 November 1945. 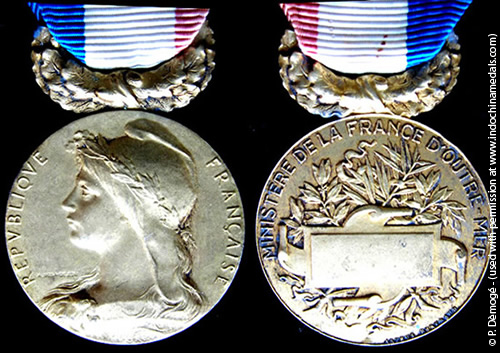 That title was changed 8 January 1959 to "Minstère délégué auprès du Premier ministre chargé du Sahara, des DOM-TOM et de l'Energie atomique". 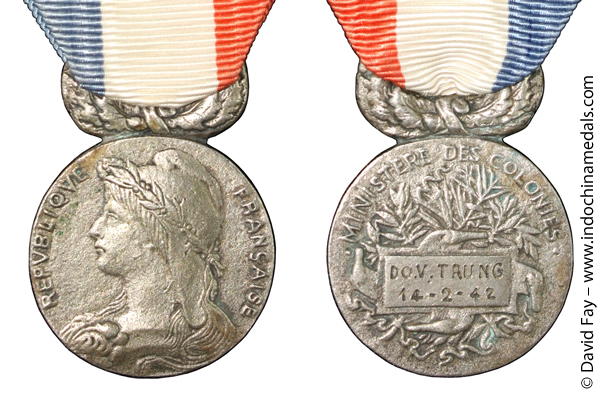 It became the present Ministere des DOM-TOM 14 April 1962. 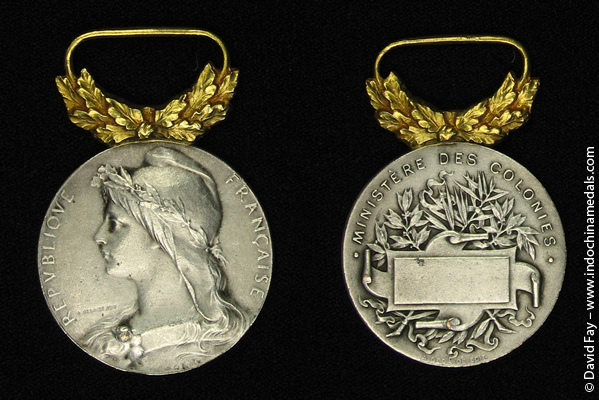 The third design by Rivet is apparently rare.